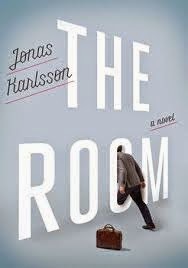 Björn works for the Authority, a bureaucratic government agency, which will explain why he often escapes to The Room in the new book by Swedish author Jonas Karlsson. He has a desk in the middle of a room of similar desks, but he's constantly annoyed by his co-workers. They don't dress up to his standards, work up to his standards, or have sufficient intelligence to comprehend his superiority. He does his work in regimented 55 minute stretches, allowing himself a break only at his self-appointed times. Once, while on his way to the bathroom, he notices a door in the wall. Upon opening it, he discovers a room. There's nothing particularly special about the room. It looks like a generic office with a desk and file cabinets. When Björn steps into the room, however, he finds it very calming and peaceful. His co-workers, never very fond of Björn and his strange ways, soon complain to the boss, Karl, about his odd behavior. It seems that whenever Björn visits the room, what his co-workers observe is him standing completely still, staring off into space. When he's in this position, they tell him, he acts as if he can't see or hear anyone else. Björn attempts to convince himself and others that the room exists. His put-upon boss tries to humor Björn, especially after Björn begins staying late and going into the room after everyone else has left. He finds that while in the room, he's able to think more clearly and logically than ever before, and he is able to produce outstanding work. His output has even caught the eye of superiors outside the department, who use it as a model for how all the work in the Authority should be performed from now on. Naturally, this praise makes Björn feel as if he has the upper hand. He begins setting conditions: he must be allowed to go to the room whenever he wants, he asks for certain co-workers to be fired, etc. As tensions build, the question remains: does the room exist, or, as Björn thinks, is it being kept secret for some nefarious reason? The book is short and quite funny in places. Even though he's clearly socially isolated and awkward, Björn is sure that he is brilliant and that everyone else is jealous of him and plotting his downfall. He never waivers in his beliefs that the room exits, or that he's on an unstoppable upward career trajectory, even if all indications are that he could be mistaken on both counts! Jonas Karlsson, the author, is a well-known Swedish actor, famous for the films Cockpit and Bang Bang Orangutang. It's really exciting to see him branching out so successfully into fiction writing. I'm sure this will be made into a film soon!